"I couldn't be anymore thrilled. Just for the chance: That's all you can ask for"
A Green Beret-turned-Texas Longhorn long snapper has won a contract with the National Football League's Seattle Seahawks. Nate Boyer, who has served on several deployments with special forces, signed a contract with the Seahawks after the draft. He will be joining the team in minicamp this summer, Military Times reports. 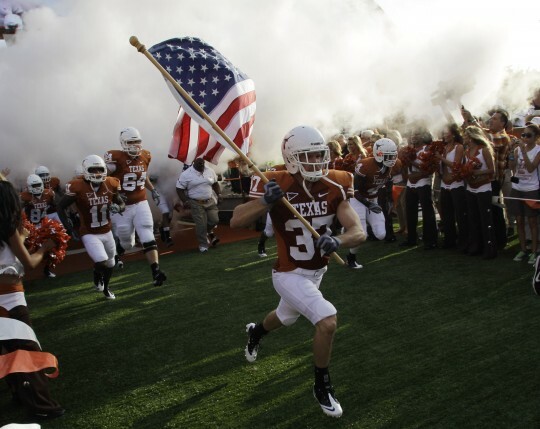 Boyer recently left service, having transferred into the Texas Army National Guard from the active-duty Army while playing at the University of Texas. Maples received advance permission from his chain of command at Benning to attend minicamp if any NFL teams extended the offer, Interdonato reported. Boyer said he was excited to see his dream of playing in the NFL come true. "I'm playing for a great team in a great city," Boyer told the NFL Network on Saturday. "I couldn't be anymore thrilled. Just for the chance: That's all you can ask for." Boyer, who has packed on 30 pounds to his 190-pound playing weight at Texas (he found it difficult to add weight while on deployment over the summer, he said), told Army Times in January that his post-Longhorn itinerary included an internship with the Hollywood production company run by Peter Berg, the director behind "Friday Night Lights," "Lone Survivor" and "Battleship." But in discussing his future plans, he said, "If it includes a stop in the NFL, why not?" Raymond Maples, a recent West Point grad, has also been invited to join the Green Bay Packers minicamp for rookies and has a shot at making the final roster. This entry was posted in Culture and tagged Army, Football, Military. Bookmark the permalink.